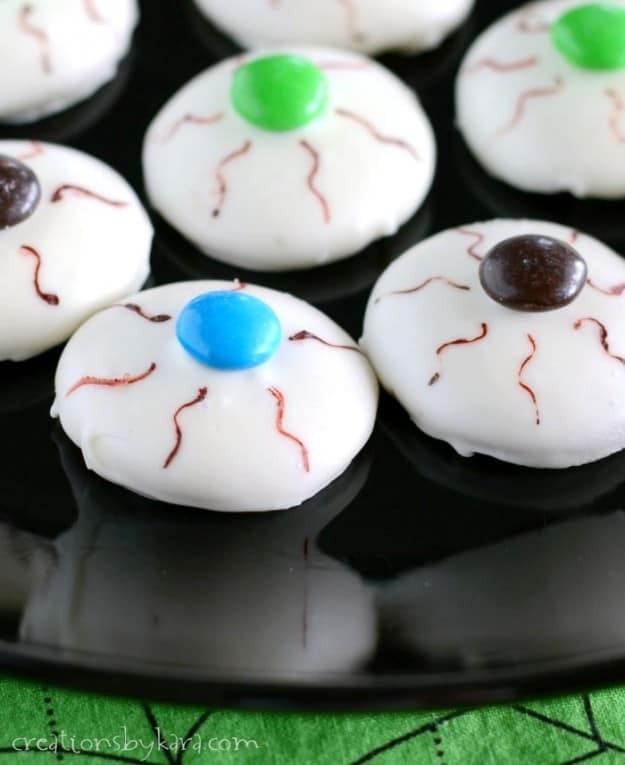 If you are in need of a quick and easy Halloween recipe that kids (especially boys) will love, you have to give these Bloodshot Eyeball Cookies a try. 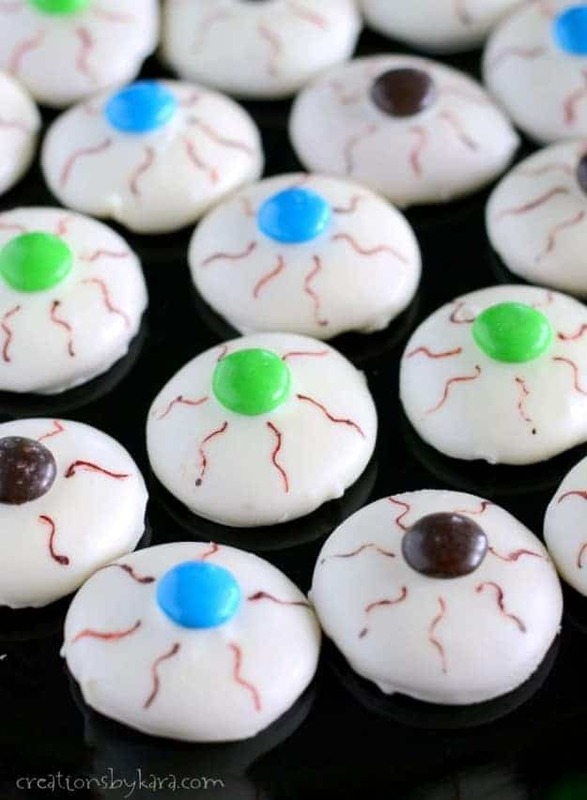 I was inspired by photos of eyeball cupcakes I saw in a magazine at the orthodontist’s office. 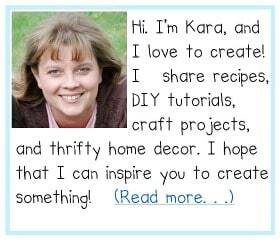 But I wanted something less messy. Cupcakes tend to spread crumbs over half the planet. Or at least half my house. 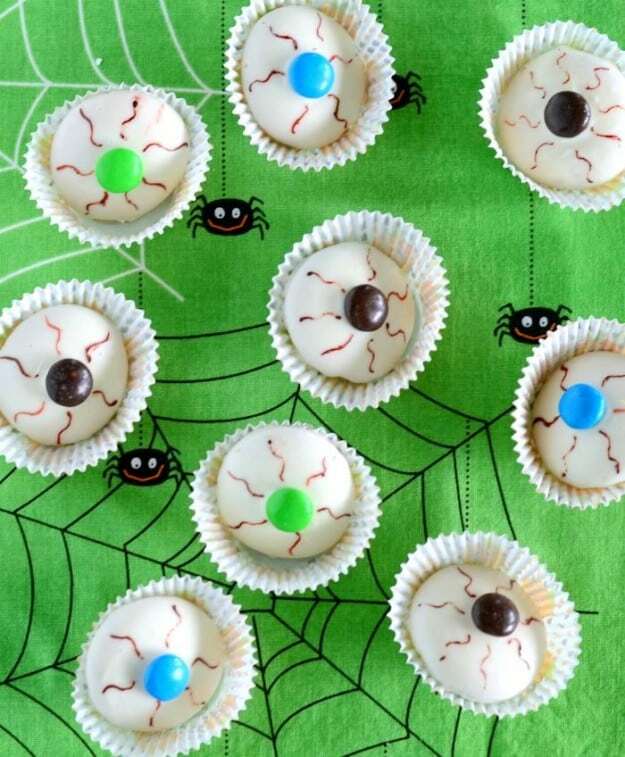 These eyeball cookies start with vanilla wafers, so less crumbs, and you don’t even have to do any baking. It doesn’t get much easier than that! 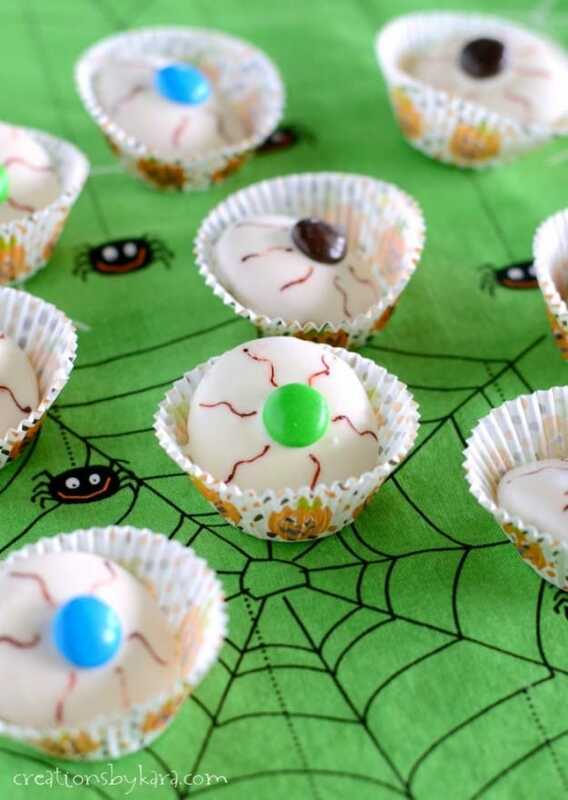 Quick and easy Halloween eyeball cookies made with vanilla wafers and white chocolate. Combine the white chocolate chips and the shortening in a glass bowl. Microwave at half power, stirring every 30 seconds or so, until melted and smooth. Brush the crumbs off the Vanilla Wafers, then dip them into the melted chocolate with a fork. Tap off the excess chocolate, then place them on waxed paper. Place an M&M in the middle of each cookie. If your chocolate starts to thicken, just pop it in the microwave for a few seconds, then stir. Let the chocolate totally set. Then take a toothpick and use red food coloring to draw the lines on the cookies. Tip: Place a drop of food coloring on a piece of waxed paper, and dip your toothpick in it. Wipe off the tip of the toothpick often, because chocolate starts to build up on it. Let the cookies sit till the food coloring is totally dry.